We decided to see a little of Romania while we are so close. 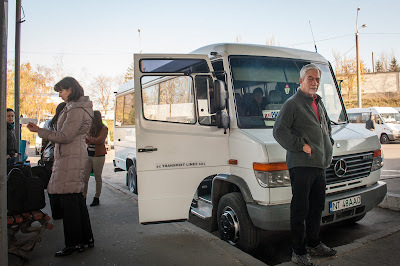 Last week, I figured out how to get to the South Bus Station in Chisinau to buy bus tickets to Suceava, Romania. Most people wait to buy them at departure time, but we didn't want to leave anything to chance since we had already booked our lodging and tour. The cost for two one-way tickets was about $32. Friday morning, we arrived early at the bus station. Just before departure, there was a little confusion because there were more passengers than seats. The ticket lady came out and checked the tickets of everyone who was on board. She kicked one young man off and other passengers were left behind. Exactly on time (8:45 am), we left Chisinau via a 19-passenger minibus. It was not the large-sized, WiFi-equipped bus that we had anticipated. As the minibus driver left the parking lot, he stopped to pick up the young man who had just been kicked off. During our very slow journey (190 miles/306 km), the driver stopped for every traveler standing near the road. Sometimes, he stopped to pick up bags to deliver elsewhere. Eventually, there was standing room only and an aisle full of duffle bags on this 19-passenger minibus. Just before the Moldovan/Romanian border, the driver opened a carton of cigarettes and handed several of the passengers 2 packs each. After safely crossing the border, the driver handed a bag to the passenger behind him. She went down the aisle collecting the packs of cigarettes from those passengers who assisted in the smuggling. When the driver had the bag again, it must have felt a little light because he asked the woman behind him to count the number of packs. Fortunately, the number reconciled so none of the passengers had to be searched for contraband cigarettes. We later found out that two packs of cigarettes is the magic number allowed per person into Romania. The Moldovan border guard asked Dan and me if we were carrying any drugs or guns. We said, "no." He asked a second time if we had any guns--"No, we don't have any guns!" The Romanian border guard wanted to know how many packs of cigarettes we had. Dan had two. 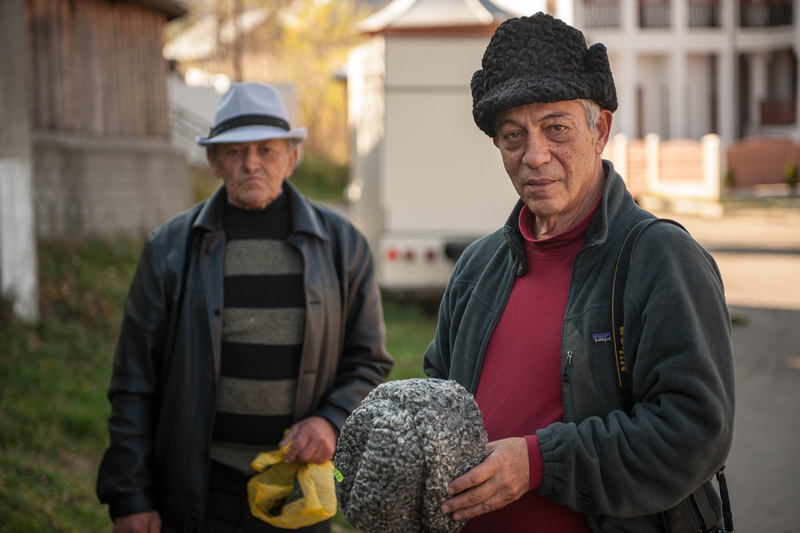 Seven hours later, we arrived in Suceava, Romania. 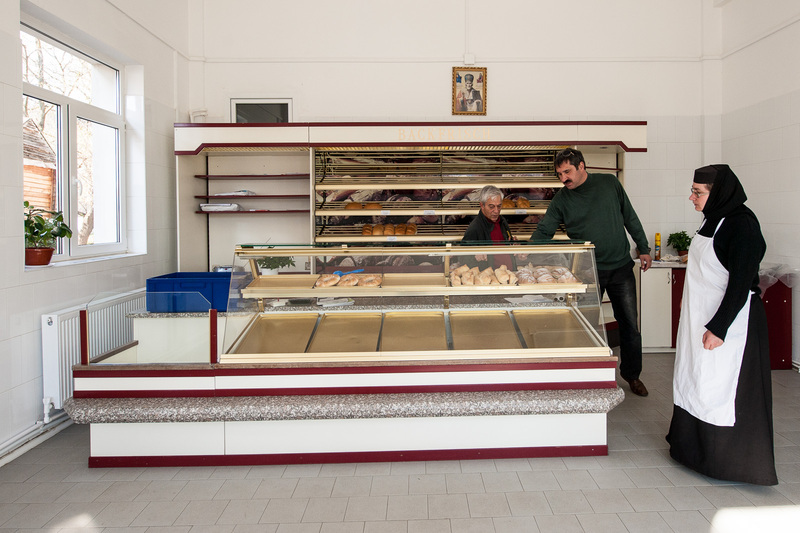 Suceava is in Moldova--the geographic area of Moldova. The Republic of Moldova, where we currently live, and the geographic area of Moldova in Romania used to be one. 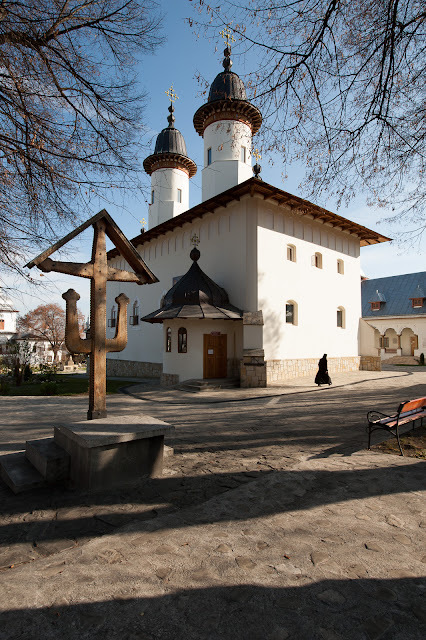 During the days of Stefan the Great (15th century), Suceava was the capital of Moldova. The historical geographic area of Moldova is now spread over several countries: Romania, Moldova, and Ukraine. We came to see the beautiful 15th and 16th-century "painted" monasteries that remain in Romania's Moldova. The first day of sightseeing took us first to several monasteries and a fortress used by Prince Stefan the Great (Stefan cel Mare). 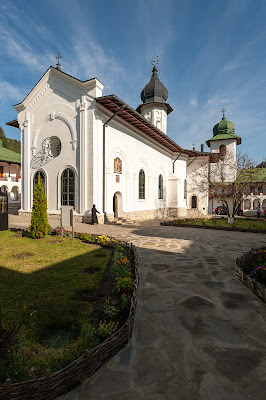 The construction of Neamţ Monastery commissioned by Stefan the Great was completed in 1497--5 years after Columbus was credited with discovering America. A young monk named Gregory asked where we were from. When we said California, he immediately began listing California cities: Redding, Sacramento, Los Angeles, etc. When he found out that Dan's daughter lives in Virginia, he said Dulles International Airport. He sang "Cecilia" to me. He also discussed US current events (shootings, of course) with us. He'd be really good at Trivial Pursuit. 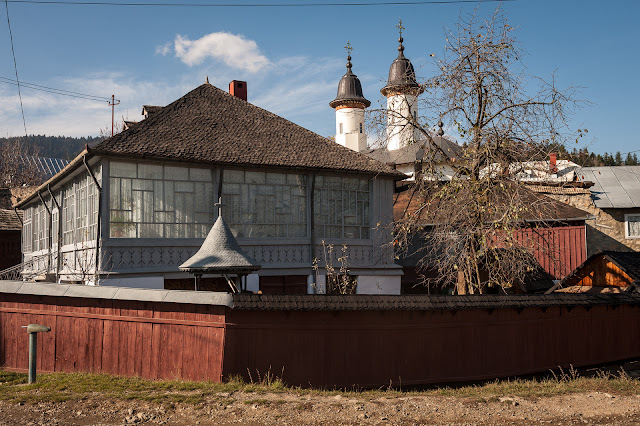 The next stop was at the nearby Agapia Monastery (built 1642-1647). 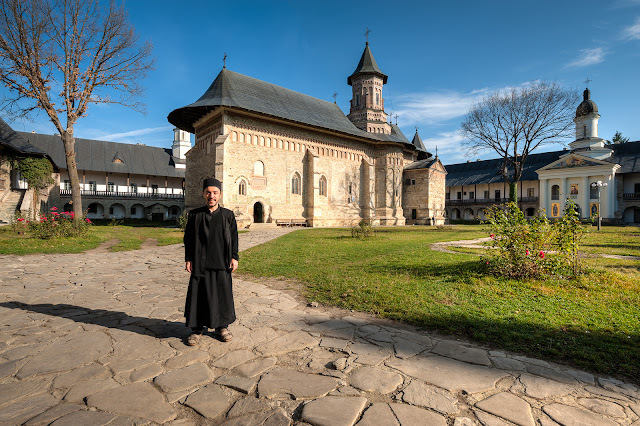 This monastery is occupied by nuns. There was a religious service underway so we didn't go inside. The songs of the nuns and their angelic voices drifted outside the church keeping us company while we strolled the grounds. 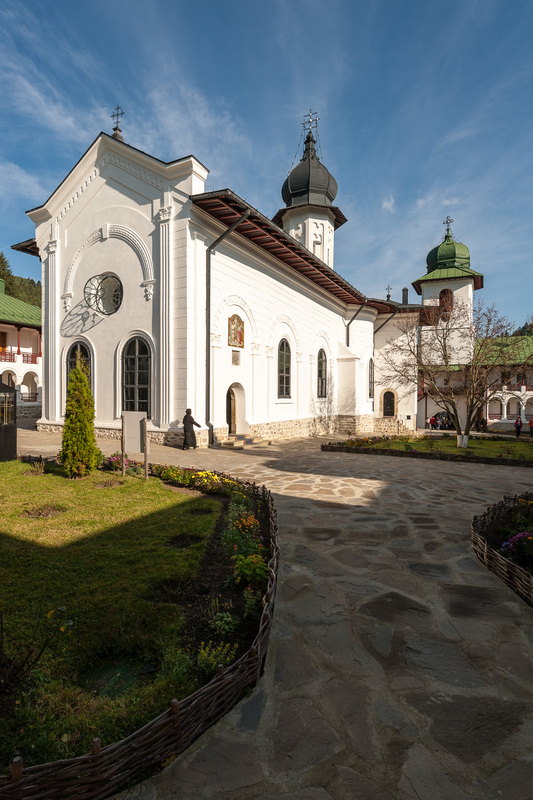 The next stop was at the 18th-century Varatec Monastery which is also occupied by nuns. 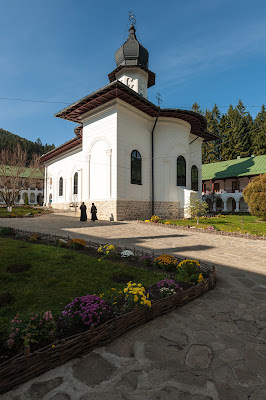 In fact it is the largest convent in Romania with about 450 nuns. Only the nuns live in the village surrounding the monastery. No men in the village; the nuns looked quite serene. We walked around the village before entering the monastery. Every house was immaculate and was surrounded with a low fence. Small grassy trails between the properties connect to the road. A guy selling hats was sitting outside the monastery. Dan, still searching for that perfect hat tried on first a gray lamb's wool hat and then a black one. We couldn't decide, so we told the hat seller we'd think about it as we walked around the town. When we came back, he was gone so Dan still doesn't have a hat. I think the black one was the best. Before leaving Varatec Monastery and village, we stopped in at the bakery run by the nuns. We left with several sweet cheese, apple, cherry pies. 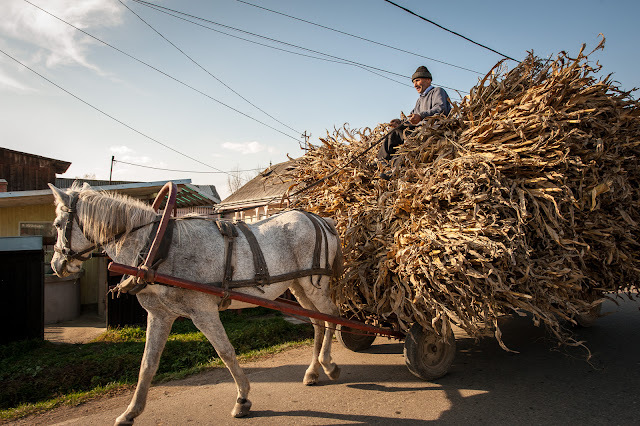 With winter just around the corner, we saw lots of wide-load wagons piled with cornstalks gathered as winter food for animals. Village houses had cornstalks piled up pyramid style or leaning against the sunny side of fences and houses. We stopped at a small museum and art workshop created by Nikolai Popa and his wife. 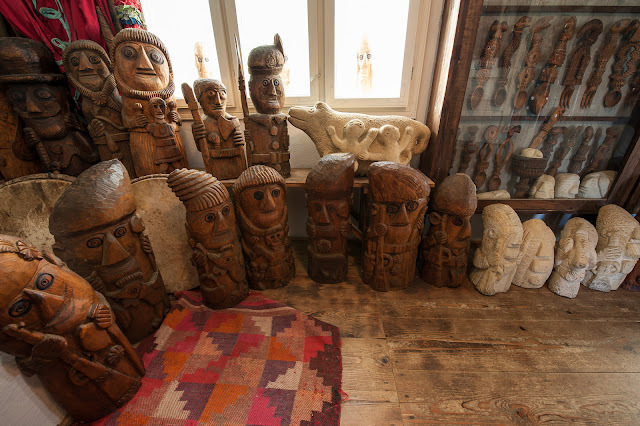 Nikolai was a sculptor and his wife made masks. Sadly, Nikolai died last year, and his elderly wife has Alzheimer's disease. The museum galleries are being maintained by their daughter and her son. The main part of the museum is a traditional house from this area of Bucovina. 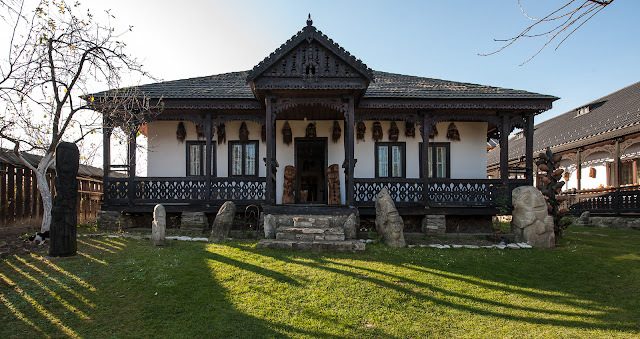 This area of the geographic region of Moldova was named Bucovina by the Austrians when they controlled the land in the 19th century. Bucovina means Land of the Beech Trees. 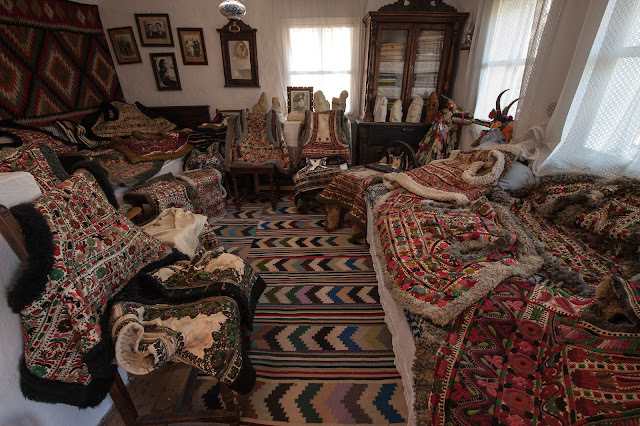 Every part of the house is filled with art created by Nikolai and his wife and treasures from Romania's past. 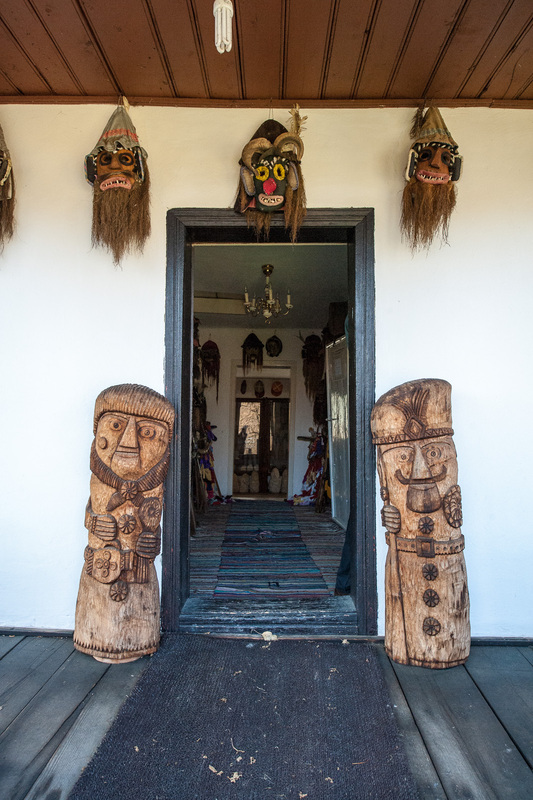 Nikolai's sculptures dot the yard and the foundations are decorated with drawings made when the plaster was wet. Our last stop of the day was the Neamţ Fortress. It is a half-kilometer walk up to the fortress from the parking lot. In some sections, the walk was so steep it might as well have been a ladder, but the view at the top is beautiful. The Neamţ Fortress was built in the 14th century but expanded and made more defensive in the 15th century by Stefan the Great. For instance, Stefan the Great closed the original lower entrance and built a long ramp connecting to another entrance. This long entry ramp gave his army a tactical advantage exposing would-be invaders long before they made it to the front door. 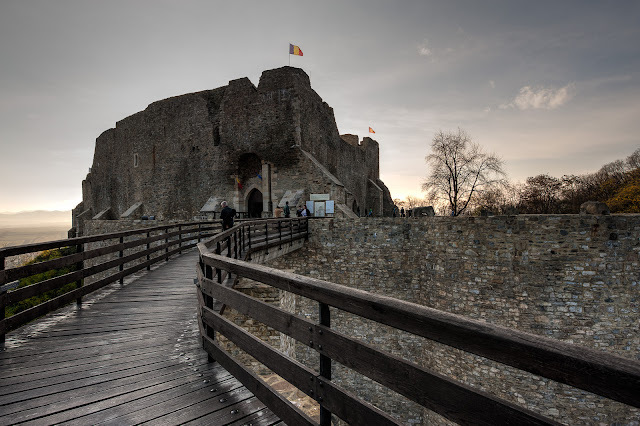 The Neamţ Fortress was part of Stefan the Great's defense system, along with fortresses in Suceava, Hotin (present-day Ukraine), Soroca, Orhei, Tighina (present-day Transnistria), Chilia and Cetatea Albǎ (both in present-day Ukraine). 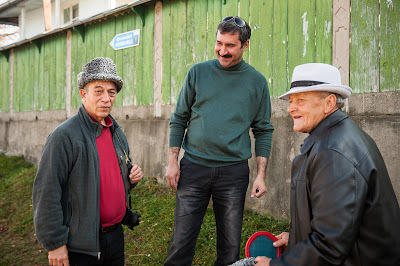 Soroca and Orhei are in the Republic of Moldova.